After a mild winter and a cold, grey spring I was wondering whether Steelfest would be opening the summer festival season 2014 with me wearing sunglasses or gloves. To be on the save side, I packed both and headed towards Hyvinkää hoping for the best. At least the forecast promised decent weather for this mid-May weekend that fast had become a fixed date in any extreme metaller’s spring/summer calendar after only being organized for the third time in this small town ca. one hour by train outside of Helsinki. The festival organizers offered the full package again, from two day tickets at 78€ that started running low at the end of April, to one day tickets at 51,50€. The Steelfest frenzy was rounded out with pre-clubs the weeks and months before as well as after clubs limited to 100 tickets. The hotel packages in the two local hotels, Cumulus and Rantasiipi were sold out already by January and the lucky ones got a room in Cumulus which is only a stone’s throw away from the festival area making for a very comfortable weekend. Yet, there were a few changes this year: ticketholders were only allowed to exit the area once per day. This was to avoid causing potential annoyances to Hyvinkää’s inhabitants bypeople going to drink outside the festival area constantly which is an acceptable compromise for a festival held in a town center. Another thing was a bit baffling however: despite being a festival that has an 18 year age limit which usually means you can take your drink everywhere this year it was not like that. There were again two stages, one outside and one inside, a food area, merch and other shopping booths next to two main bars and a cider stand. While I still get the logic of not being allowed to take your drink to the food area I still have no idea why one was allowed to take drinks to the inside stage as close as you wanted but there was a drink-free, fenced off area in front of the outside main stage. The other thing that caused some hassle was that some of the food booths did not accept cards which in a card-using and used country like Finland will always evoke the odd frustration and comment here and there. 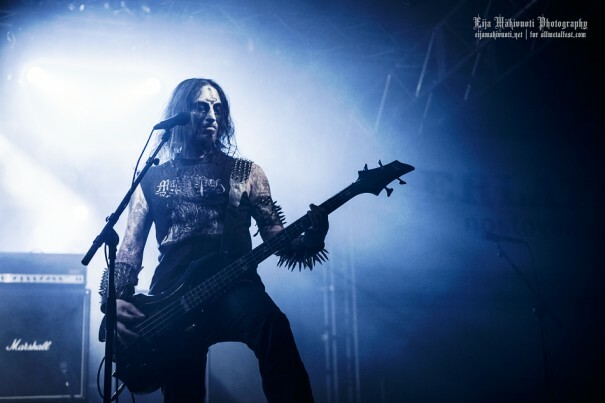 As unlikely as this usually is but world politics influenced this year’s Steelfest: Nokturnal Mortum from the Ukraine had to cancel their performance due to the uncertain situation in their home country mid-April and a bit later also Maneim from Croatia backed out. 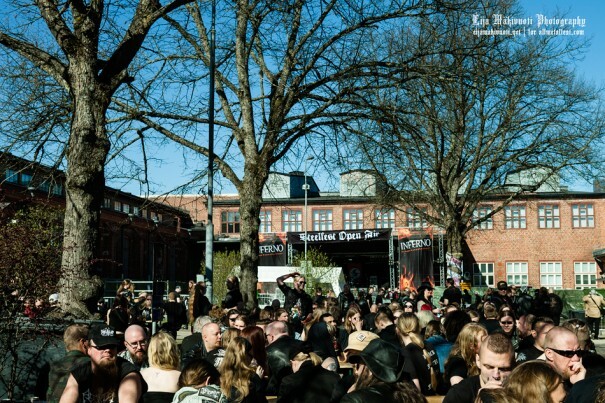 But no one was discouraged by this and the excitement for the festival was high the weeks and days before especially since another extreme metal summer classic was painfully missing this year with Hammer Open Air not being organized. The festival started off with the usual hotel room and park pre-drinks and the weather while a bit chilly and cloudy played along nicely. In the best of moods, we made it to the area in time to see Baptism as the first band on the inside stage. The organizers also had taken note of last year’s potentially dangerous table arrangements with the huge wooden cable rolls that caused the one or other bruise when people tried to jump on them to have a sit down. This year the back part of the hall was all set up with tables and benches. Baptism seemed to have decided on a casual Friday as they showed up without their usual hooded cloaks. 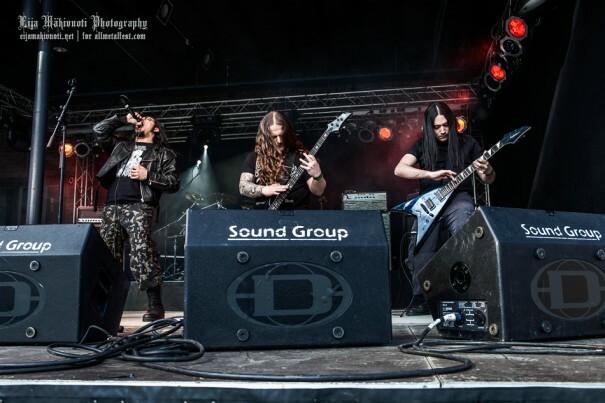 But this did not matter and actually suited the occasion: their normal, straight forward black metal appearance shouted“Festival, now!” They were powerful and good as they usually are and for being only the second band of the evening a decent crowd had already gathered. The mix of fast and slow, mellow and dynamic was just perfect to get into festival mood even if for a few songs such as The Prayer the sound was a bit mushy so that not all nuances came fully through. Their show was as ever strong, creating a dramatic presence with an understated performance. 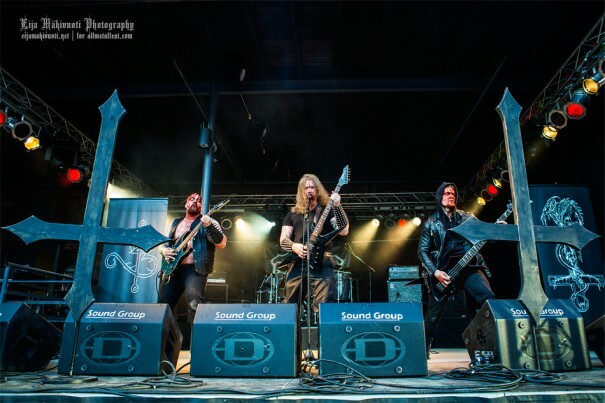 On the outside stage, Raven Woods from Turkey were representing a geographic area that is a bit more exotic when looking at metal music maps. The Finnish weather gods seemed to like what they heard as even the sun came out for a while. This might have been the reason why the crowd in front of the stage was not that extensive – everyone was enjoying the first summer-festival-feeling-moment. The gig was nice but it was not strong enough to drag people away from their drinks in the sun especially as they were not allowed to take them in front of the stage. But it seemed that Steelfest continued the tradition of being quite lucky with the weather for it taking place in mid-May which in Finland could mean anything from snow to 30 °C. But even without moshing in front of the stage, Raven Woods’ melodies were just right to sit and enjoy the moment. Hautakammio from Finland tried to wake their audience from the work week tomb next on the inside stage. While the band was energetic, the crowd was a bit reserved. Everyone was in a good mood and the guys on stage got more aggressive throughout the gig and tried to push the festival goers but they refused to fully wake up, no craziness erupted. The stages continued to be in Finnish hands as Maveth, doused in blood,entered the stage outside that was decorated with huge inverted crosses, banners with snakes and more crosses – the works. Their blackened death was low, powerful and dynamic, hair was flying – in short, it was good and just the right low range to hit you right into your guts and make your beer filled belly feel all nice and warm. Valkyrja from the Swedish neighbor country made it clear from the start that despite their name they had nothing to do with Viking or Pagan metal. 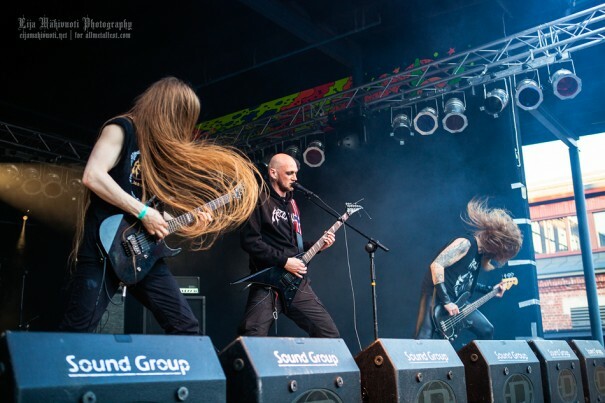 It was fast, black and made your head mutate into a hairy propeller which the crowd obviously appreciated: Excited head banging on and off stage, the audience applauded, taking their shirts off. The only setback was the again partly muffled sound. You could hear and enjoy the music but some of the dynamic was lost because of that. Luckily their music and the gig were powerful enough to still carry people away. And then started the time of the four big names of that first Steelfest day: Aura Noir, Nifelheim, Deströyer 666 and ever mighty Inquisition were next. A surprisingly small crowd showed up for Aura Noir and the mood was more relaxed than intense which could have to do with the night getting a bit more chilly and people rather having a sit down with another beverage instead of standing in front of the outside stage drinkless. In the front however, hands and hair were in the air and even small mosh pitserupted. The band seemed to enjoy themselves and played a tight set, and there was energy building up between band and audience. 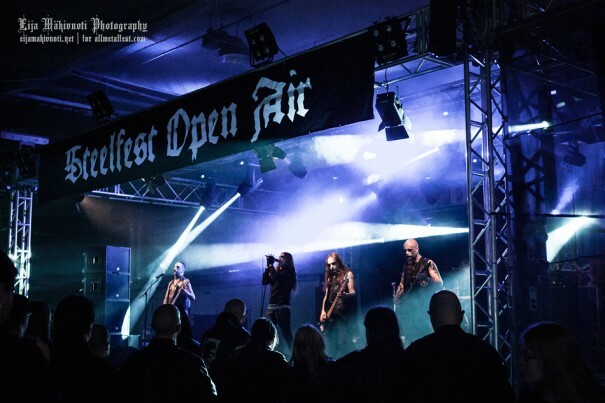 Nifelheim, the band with the most and spikiest spikes, offered a bit more to see visually and also attracted a bigger audience that then also was quite into the whole gig. Especially Storm of the Reaper stood out and captured everyone, its melodies enticing while the speed and rhythm drove forward. That is how the whole gig went, 666% of pure hellfire blasted over the gathered crowd. After that, it was outside for one last time this night to see Deströyer 666. Unfortunately, those watching Nifelheim intensely missed part of their set as either they started early or Nifelheim played too long. This was not the best start for this gig but there was a crowd and people were hurrying forward once they realized K.K. Warslut and Co.were already on stage, shouting out for them. 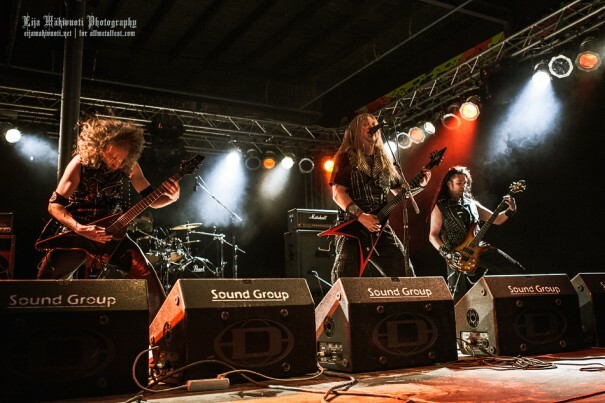 The gig had everything it was supposed to have, – good, solid Deströyer 666 live energy and performance. Yet, possibly because not seeing them from the start which was a bit of a buzzkill, it was just not as good as previous shows I had seen. 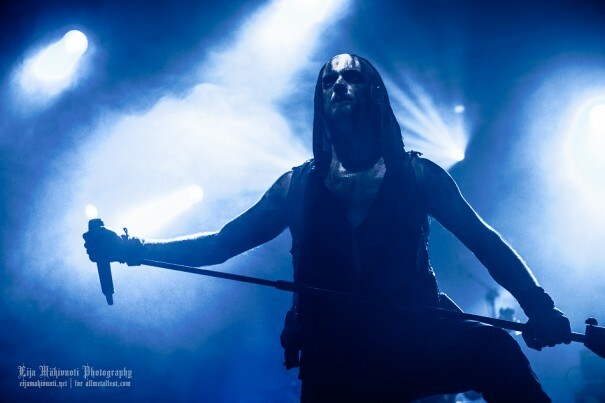 Their 2012 gig at Hammer Open Air in Turku had been incredibly amazing and it is hard to top that. But the gig for sure had its highlights such asTrialed by Fire and I am the Wargod that were greeted by frantic shouts from the audience. Moments like these show Deströyer 666’s best side: songs that combine amazing melodies with music that packs a punch without losing its beauty and melancholy and that are incredibly dynamic and captivating. The clapping, shouting, moshing and head banging crowd certainly agreed. The last band of the night, Inquisition faced the same dilemma with me as I had seen them at Nosturi in Helsinki in 2012 and that must have been the most hypnotic, intense gig I have ever attended or rather experienced because it took everything to a whole other level. The Steelfest gig was solid and everything you expect from Inquisition but it just did not compare, possibly also because the sound did not fully capture their music.The gig had its unique, hypnotic Inquisition moments where your whole being – heart, body, mind and soul – is absorbed into the music and the rhythm, and nothing exists except the slow beating pulse that comes from what feels like your real heart and life source: Inquisition, pumping their musical blood into your veins, keeping you alive in their universe where your whole existence is floating, dissolving and reuniting. They proved once again, like Urfaust would too later this weekend, that it is enough to have two people on stage to blow every one’s socks off. Though, they had some (immoral?) support on stage with them this time in the shape of two hooded goat’s head statues. A sunny Saturday promised a good start for day 2 even if waking up was a bit slow for the one or other festival goer. Archgoat were a good choice to begin at least our day with. 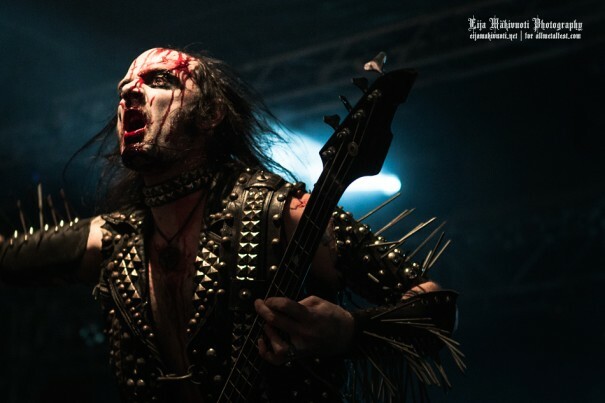 Their dynamic and almost groovy black metal slowly dragged the quiet crowd from their post-day 1-comas and into the mood of the second day. With the perfect summer festival weather it was almost too nice to go inside but their deep music found you and pulled you closer and closer to the darkness looming inside. Their stage show was ever minimalistic and majestic which was just the right thing to watch while slowly arriving in the festival mood. 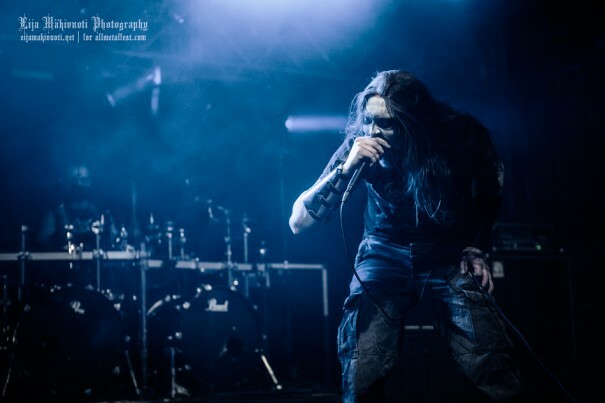 After Urfaust were my personal favorites from the 2013 Tuska Festival I could not wait to see them again and it was no question whether to watch them sitting down with a drink or quickly downing the last sips and hurrying towards the stage. They started powerful and with a good sound in front of a nodding but otherwise slightly reserved crowd. And they did what Urfaust do: creating magical, intense atmospheres that are both harsh and delicate. They do with only two people what sometimes bands of 6 don’t manage. The slowly setting sun added to the beautiful atmosphere but I was still wondering why they did not play inside, it would have been even better. This gig was one of the festival’s highlights for sure. It was difficult to follow the Urfaust magick but Desolate Shrine tried anyways with their first live show. It took me a little to warm up to them and the audience was not too big at first. But throughout the gig they did not only seem to capture me but also others as the hall slowly filled up. The stage was bathed in dark green and blue lights, creating an underworldly, gloomy, mystical scenery in which the five hooded figures stood as rigid black pillars that dispersed music, achieving maximum impact with minimality. The musicians and two vocalists created a dense wall of sound that slowly swept over you. Throughout the gig both the crowd and the band seemed to get into it more and more and it was a great feeling to let yourself be dragged into this intensity. 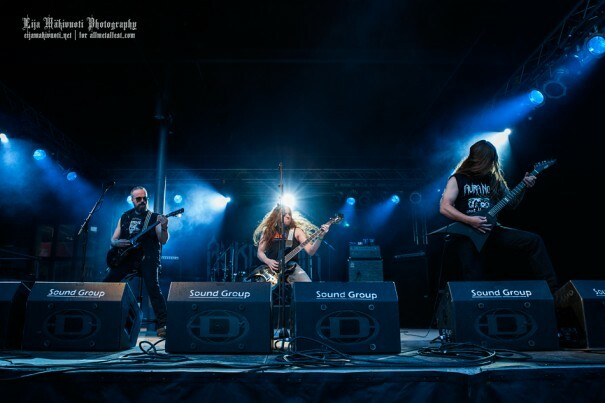 Another high light was waiting outside – Aeternus from Norway were set to destroy the stage and to make it short: they did. The crowd was again surprisingly small, maybe people were caught up in the longer growing drink queues but the mood was great and applause was plentiful. With their dynamic music and melodies they were one of this year’s highlights and even got a wall of death in the sunset going. While Ares was exuberating energy and atmosphere with just his voice, Specter and Frode Kilvik more than made up for Ares’ lack of flying hair. A powerful, strong show of a band that would be more than welcome to play in Finland more often. From Norway back to Sweden with Necrophobic. 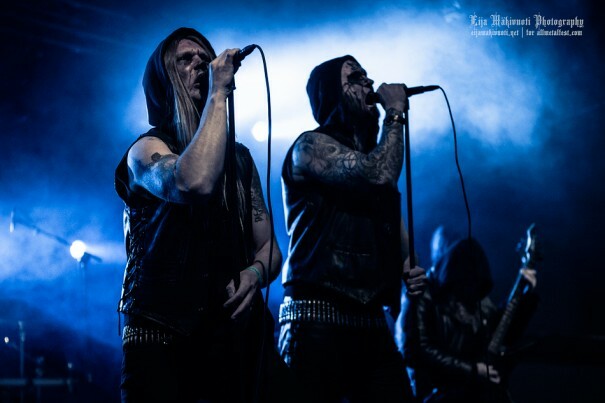 Since having seem them at Hammer Open Air in 2012 they had had a bit of a rough patch as in 2013 former vocalist Tobias Sidegård was sentenced to several months of prison for beating his wife. 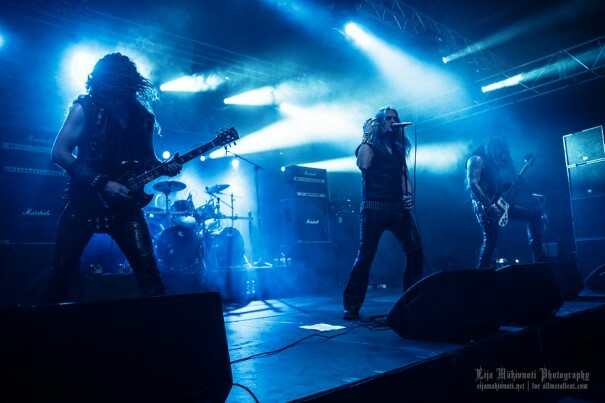 Their new/old vocalist is Anders Strokirk who had already been with the band from 1992-1994. With their latest album Womb Of Lilithu up their sleeves they now were on the road again. Their gig was a mix of old and new songs. It was loud. It was good. But the sound was again lacking the nuances. Despite that challenge, they managed to get to the audience and it was a pleasure to watch them once again. 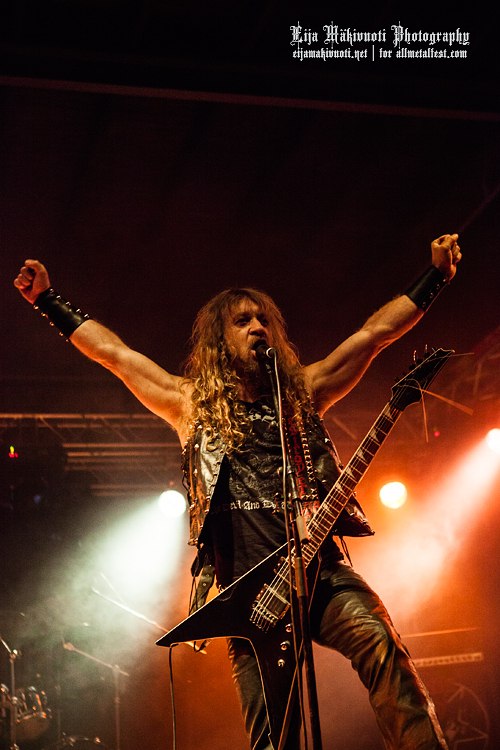 Vader were the last band of this year’s Steelfest to destroy the outdoors and that they did. 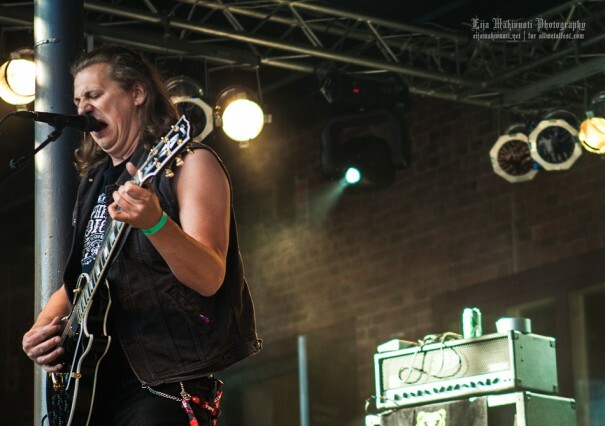 They delivered their usual full frontal, in your face show to an appreciative crowd and got all the last bits of aggressive power out of the festival goers to leave them in a still energetic but mellower mood for the festival’s final act: Primordial. 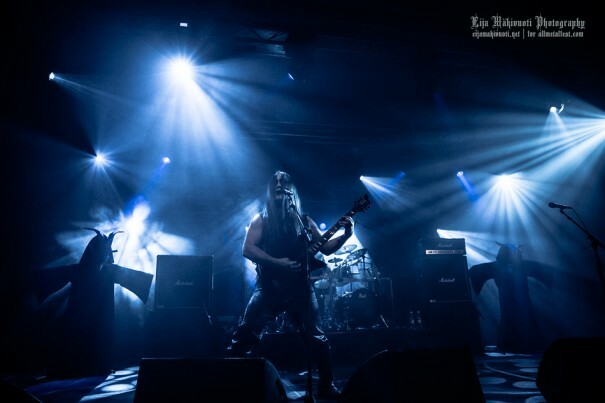 While I have always liked Primordial, appreciated their music and enjoyed them live I never fully clicked with them for no particular reason at all, it just had not happened. But I was looking forward to see them again as they are always nice to see and make for a good last festival band. Their powerful but melodic music that resonates well with the slowly arising post-festival melancholy that sometimes starts as early as the last band made them the perfect fit. The gig was really vibrant, even beautiful and for some reason more emotional than other gigs I had seen– possibly exactly because of that hint of melancholy already being present. Everyone seemed to make the most of these last moments filled with music, festival energy and joy, and put their emotions into the air and drew energy and strength from the music. But all good things must come to an end and with this Steelfest was over again, until next year. Only 364 days to go!